Clear Out Ink demonstrates how the use of Zimmer “Chillers” can greatly improve comfort for clients undergoing laser tattoo removal. In this video, the company’s owner, James Dean, points out that his client has previously experienced the treatment without the benefit of integrated Cryotherapy. Mr. Dean talks about the skin cooling effect of the cold air device before launching into the removal of his client’s hand tattoo. “You’ve already done one time without the chiller,” says Mr. Dean. “Watch the difference.” He samples the cold air on his client’s hand and simultaneously applies Q-switched laser energy. (Zimmer Cryo devices can reach temperatures as cold as -30°C to combat laser discomfort and risk of thermal injury.) 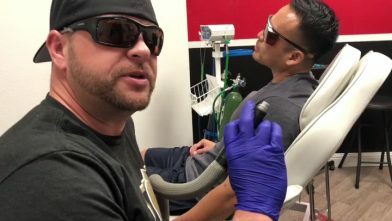 “A lot better, huh… A lot better with the Chiller cold air… This thing is awesome, huh?” Mr. Dean continues the laser tattoo removal while his client confirms that he is feeling fine and appears to be very comfortable throughout the treatment. Moments later, the hand tattoo has disappeared. James Dean of Clear Out Ink shared the below video and comments about Zimmer Cryo technology without compensation. Clear Out Ink Laser Tattoo Removal is operated by James Dean, a qualified Laser Certified Technician and Certified Laser Safety Trainer. The clinic prides itself on offering a painless tattoo removal technique and on their ability to remove a full spectrum of colors. Clear Out Ink uses the Quanta Q-Plus C Q-Switched Laser and boasts that they were the first company to bring this advanced laser to the Las Vegas area. The company advertises their pairing of Zimmer Cryotherapy with all laser tattoo removals. This ensures that their clients receive all-natural skin cooling and numbing, added comfort and reduced-risk treatments. Not only is Clear Out Ink a clinic where the public can have their tattoos removed by Certified Laser Tattoo Removal Specialists, but it is also an academy that offers training to industry professionals desiring certification. The company has trained doctors, nurses, tattoo artists and others from around the country on methods for safe and professional laser tattoo removal. Clear Out Ink is located in Henderson, NV, about 15 miles south of Las Vegas. The clinic resides within the clean, upscale Look Younger facility. In the building, medical professionals and various independent practitioners are on-site to answer questions and provide cosmetic and medical services such as plastic surgery, podiatry, medical microscopy, electrolysis, laser hair removal, IPL, chemical peels, skin tightening, Botox® and more. To learn more about Clear Out Ink, visit them online at www.clearoutink.com.